A rusty locker key recovered from the Titanic was auctioned off on Saturday for a staggering £85,000 -- or $104,000 -- according to The Guardian. The key reportedly belonged to Sidney Sedunary, a 23-year-old third-class steward, who heroically died while trying to save passengers after the ship infamously struck an iceberg in April 1912. In total, the wreck claimed the lives of 1,503 passengers and crew members. 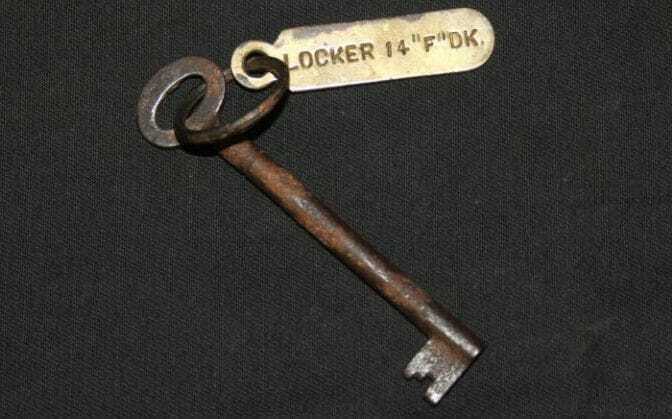 Attached to the key, which was used to unlock a cupboard containing lifejackets, is a brass tag stamped "Locker 14 F Deck," signifying that Sedunary was on the F Deck the night the Titanic sank. After the "exceptionally rare" artifact was recovered, it was sent to his pregnant widow, Madge, and remained in his family's possession until Saturday's auction. As hard as it may be to believe, this isn't even the highest sum a piece of Titanic memorabilia has ever fetched. In 2013, a violin believed to have been played on the ship was sold for over one million dollars.